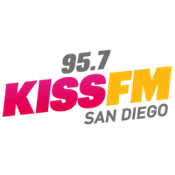 After stunting with Christmas music since mid-November, Clear Channel’s 95.7 KOGO-FM Carlsbad/San Diego has flipped to Rhythmic Oldies “95.7 Kiss-FM” tagged as “The Rhythm of San Diego”. The station is taking full aim at Broadcast Company of America’s “Magic 92.5” XHRM, which originally debuted on 95.7 in 1997 before moving to 92.5 the following year. Said station currently sits eight in the market with a 3.8 share. Listen to the debut of 95.7 Kiss-FM at FormatChange.com. Odd that they would be using the KIIS logo. The KISQ logo would have been a better fit, IMO. It’s like Jammin’ Oldies with a hint of The Point. OMD? At what will they start playing Pink and Matchbox Twenty like the other stations in the target demo?